The one-year mark after the mass shooting at Pulse in Orlando saw a community rally. Leaders and citizens embraces survivors of the attack and family of victims on Orlando United Day. 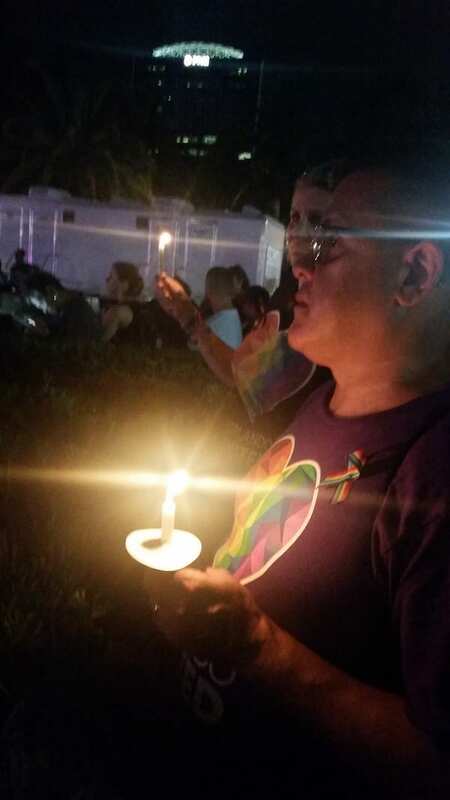 From a ceremony at the Orange County Administration Center declaring June 12 as Orlando United Day, now an annual event in the city, to a late night vigil at the nightclub, the day marked a chance for somber remembrance and a celebration of lives lost. June 12, 2016 would become what many officials called the darkest day in Orlando history. That’s the day a gunman entered Pulse and launched a mass shooting while pledging an allegiance to the Islamic State. Ultimately, the gunman killed 49 victims and injured another 53 before police killed him. The day started with the unveiling of a segment of the Sea-to-Sea flag at the seat of Orange County government. Orange County Mayor Teresa Jacobs and Orlando Mayor Buddy Dyer read a declaration of the day. Mark Ebenhoch, executive director of LoveIsLove Key West, discussed the history of the flag segment, which comes from the Sea-to-Sea flag once draped across the width of Key West and which just this weekend flew at the US Capitol as part of a pride march in Washington DC. Officials quickly moved to the Pulse site, where hundreds gathered at a make-shift memorial now surrounding the club. Survivors and families attended an event beyond the fencing, where officials including Sen. Bill Nelson and Orlando Reps. Stephanie Murphy and Val Demings praised the Orlando community for coming together in the face of a terror attack and hate crime. “This city prides itself in love, inclusion and hospitality,” said Murphy. The event honored first responders, as well, and included a musical performance by the Orlando Gay Chorus and by other artists. Later in the evening, Lake Eola hosted a larger event. The city last year repainted the park’s bandshell in the colors of the Rainbow Flag. The event included a musical rendition of Leonard Cohen’s “Hallelujah” in Spanish by Latin American artist Olga Tanon, a move that marked the somber seriousness of the event while also delivering a message in native tongue to another marginalized community devastated by the event. The shooting occurred on Latin Night at the club and the majority of victims were of Puerto Rican descent.